On May 9, 2017, the Vermont Assistive Technology Program (VATP) was excited to host a visit from Congressman Peter Welch and Kevin Veller. 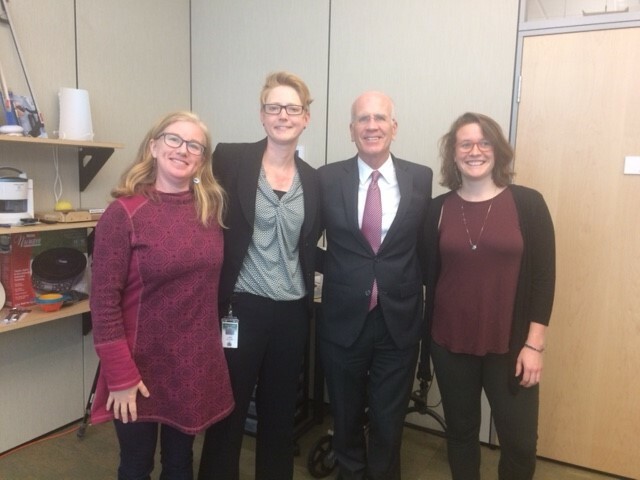 Congressman Welch explored the Waterbury Tryout Center, joined Amber Fulcher, Program Director; Emma Cobb, AT Services Coordinator, and Tracy Roux, Assistive Technology Access Specialist. The Vermont Assistive Technology Program and the Vermont Division for the Blind share the Tryout Center space. During the visit the team provided Congressman Welch with information about the services offered by Vermont’s Assistive Technology Act Program, highlighted some of the program’s partnerships, such as with the Division of Vocational Rehabilitation and with the University of Vermont’s Center on Disability and Community Inclusion, and discussed how they have provided direct support to over 4600 Vermonters with disability and aging related needs between 2015-2016. One of the highlights of Congressman Welch’s visit was hearing the consumer success stories pertaining to employment, education, and independence in the community read by Tracy Roux. Roux also demonstrated the Assistive Technology that was utilized to support these Vermonters, and Congressman Welch jumped right in to try the tools. 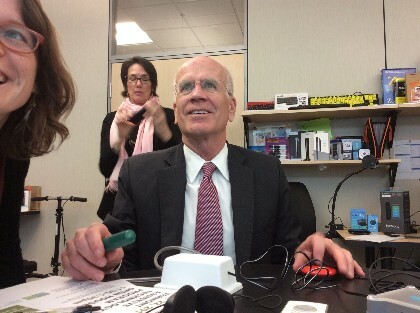 Congressman Welch learned to navigate an iPad with a Grip Switch and a Jelly Bean switch. He used the switches to operate the iPad’s camera and take a selfie without ever touching the screen! This same technology has supported consumers here in Vermont to access communication and control their environment. Thank you to the Congressman for taking the time to learn more about the services the VATP provides, and for Amber, Emma, and Tracy for their tireless work and commitment to helping others!